Anyhoot, shouldn't look too deeply into it I guess!They have a pig on their sign because they use pork a lot. Clever. This restaurant has about 40 seats, kind of cafeteria like... I don't know why I got that feeling... maybe because of the cement floors and the rows of seats. Actually, they're stools, not seats. Maybe that's where I got the caf thing. I loved the music that was playing... some classics like Les Cowboys Fringuants were very welcomed! Loved it! We were seated at the extreme end of the resto, yet when someone would open the door, the cold would be, well, very noticeable. Quite unfortunate. I really HATE it when that happens. Quite unpleasant, really. There was a tv, just hanging out there, that no one was watching and so I didn't really see the point of purchasing a tv that no one would watch. On the walls, there were stripes of colored lights and I also didn't know what they were doing there. And by that, I mean that they did not match the restaurant or the vibe. The waiters were cute in their little plaid shirts and jeans. Kinda hip and 'cabane à sucre' at the same time (or a hip cabane à sucre?). 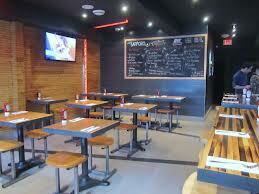 The menu is very simple: about 20 choices in all, most being either sandwiches, poutines or shepherd's pies. The prices were very affordable too, which I obviously like! No wait... love! For me, the menu gave me comforting choices: comforting poutines with meat, comforting shepherd's pies. A play on the classique québécois: there were many kinds of 'pâté chinois'! I love that! They sold wine by the glass and it was either white or red... nothing complicated. 6$ per glass. Mmmmgood, very affordable. I had pâté chinois with leeks, corn, meat and sweet potatoes. A classic! Well, not a classic per se but one of ours anyway: we always make pâté chinois with sweet potatoes. But not with leeks. And I won't start. That was my least favorite part of my meal. In the leeks' defense, ze wife loved that. The potatoes were so good and silky, the meat was very tasty and well seasoned and the whole was an all-around great mix. Two things though: the portion was way too big and it was way too hot. Food: 7/10 Good enough food but nothing to write home about! Especially not to yo mama who makes pâté chinois twice a month. Service: 7.5 It was good but not the best. First waiter we got was very nice but the second one... smiles could have been more present :) :) :) ! All in all, a good place to go hang out with your buddies, not very much of a date kinda place. You certainly don't want to spend hours there but it's enjoyable nevertheless. Mâche translates as "chew" in English.